Sonnet、旧Mac ProなどにUSB 3.1 Gen 2対応のUSB-Cポートを増設できる「Allegro USB-C 4-Port PCIe Card」などを発売。 | AAPL Ch. 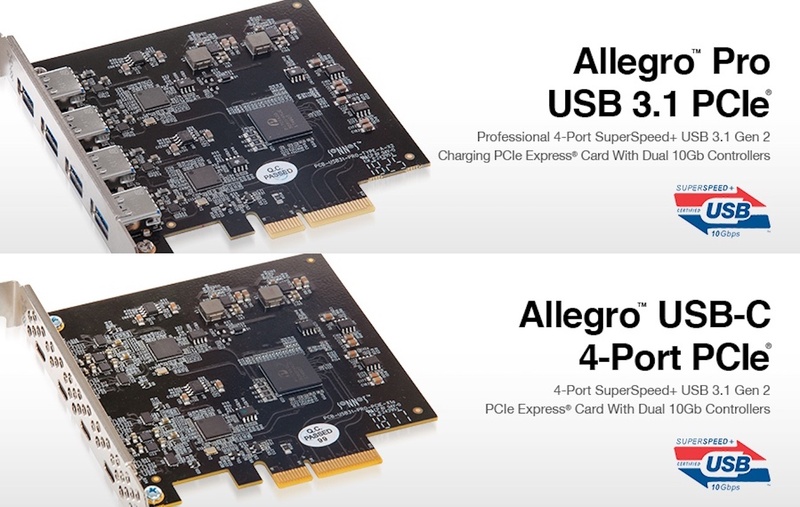 IRVINE, Calif. — Jan 30, 2019 — Sonnet Technologies today announced the availability of two new four-port, dual-controller SuperSpeed USB 10Gbps PCIe® adapter cards, the Allegro™ Pro USB 3.1 PCIe and Allegro USB-C 4-Port PCIe. The Allegro cards add four powered USB-A or USB-C ports, respectively, to any Mac®, Windows®, or Linux® computer with PCI Express® (PCIe) slots, and to Mac and Windows computers with Thunderbolt™ ports when installed in a Thunderbolt-to-PCI Express card expansion chassis.